SoftPlanet makes it possible for everyone to get free Right Click Enhancer download directly from our servers. There is no registration needed for downloading. As you know the Windows right-click menu includes a wide range of actions, which are collected there in order to provide you with much easier access. Have you ever wanted to edit this menu? You will probably be happy to know that now there is actually a way to it. In order to do that you will need Right Click Enhancer 4.1.4. This software enables you to add handy functions within your right-click context menu, add new folder shortcuts, remove/disable existing entries, add new file types, etc. Some of the actions that you can embed within this menu are copy, paste, rename, etc. In addition, you are even able to adjust your right-click context menu within Internet Explorer. 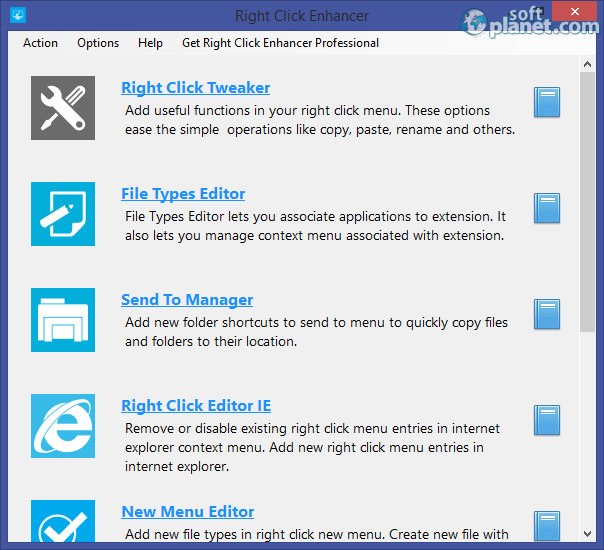 Right Click Enhancer 4 comes with a very simple, but classy control panel, which provides you with quick access to its settings such as Right Click Tweaker, File Types Editor, Send To Manager, Right Click Editor IE, New Menu Editor, Smart Renamer, etc. In addition, to right side of each one of the aforementioned menus, you will find a textbook icon, which will lead you to a help file. Working with Right Click Enhancer 4.1 seems to be very easy actually. Thanks to its GUI, all available features are very well-organized with several menus. Thus you can easily navigate among them. Unlike some other software solutions, Right Click Enhancer enables you to edit your right-click context menu without breaking it apart. In addition, this app managed to remain rock solid to the very end of our team test. 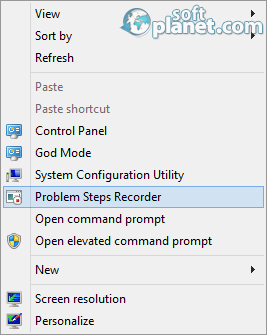 This is completely applicable to the context menu itself as well. Right Click Enhancer 4.1 seems to be a very handy piece of software, which claims to improve your user experience by providing you with the ability to edit your right-click context menu. It is completely free of charge, so please do not hesitate to download and try it as well as share your feedback with us. Right Click Enhancer is VIRUS-FREE! Our security scan shows that Right Click Enhancer is clean from viruses. The current version of Right Click Enhancer has been scanned by our system, which contains 46 different anti-virus algorithms. That ensures that Right Click Enhancer 4.1.4 is 100% safe for your computer.